Celebrate 3.14 (and the life of Stephen Hawking) at these five pie shops. If you didn’t happen to be co-president of the math club your senior year of high school, March 14 may come and go just like any other cold and gloomy day here in the great Spa City. Also, if you weren’t a math major in college and didn’t spend your days wasting away in abstract algebra class, you may be currently living under the assumption that today isn’t all that momentous. And if you don’t remember what you were doing March 14, 2015, at 9:26am, you may not care that today is Pi Day. But, luckily, I co-ran the Burnt Hills-Ballston Lake math club in 2012-13; graduated from St. Michael’s College with a Bachelor of Science in mathematics; and did have a small party at my house to celebrate the pi moment of the century. 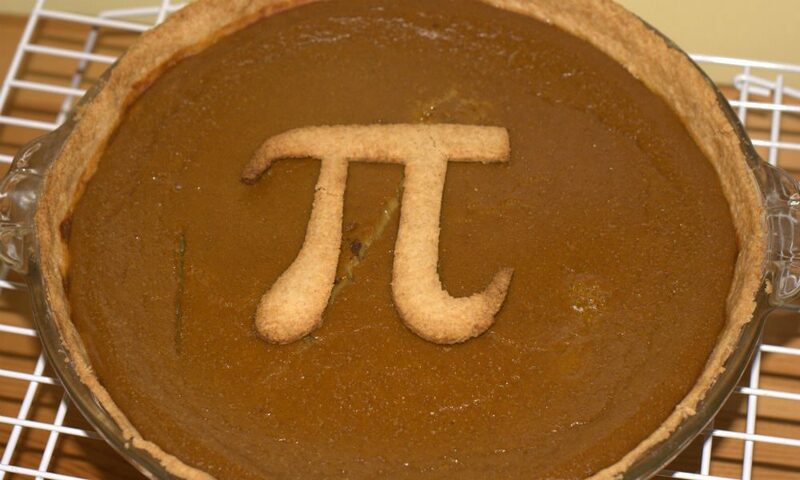 And so, it’s my duty and honor, as saratoga living‘s resident math geek, to invite the people of Saratoga to celebrate this Pi Day with a piece of Saratoga County pie. You will not only be paying tribute to the greatest mathematical constant in the world, but also to the late, great theoretical physicist Stephen Hawking, who, apparently, thought it was only fitting to end a life of scientific discovery and mathematic innovation on this very Pi Day. This pie’s for you, Stephen. Putnam Market offers up a variety of irresistible baked goods, the crowning jewels of which are their made-from-scratch pies. Fillings vary seasonally, but today they’re serving up blueberry peach; and the bestselling mixed berry, complete with strawberries, raspberries and blueberries with a crumb topping ($16.95 each). A fourth generation dairy farm and apple orchard, Smith’s has been making hungry customers happy since 1931. Over 2,000 bushels of Smith’s own apples are used in their pies each year, and all fruit pies are made with regular or crumb crust. More than 20 flavors are available for order year-round, including apple cranberry walnut, apple blackberry, rhubarb and tollhouse ($12-$12.50 each). Burnt Hills wouldn’t be the same without Fo’Castle Farm, which has been an icon in the small town since 1908. Along with its great gift shop and Stella Pasta Bar & Bakery, Fo’Castle also has the best homemade pies in town. Today’s pies are chocolate cream, Dutch apple, pecan and caramel apple nut ($13.95 each). Located right on the Zim Smith Bike Trail, Leah’s Cakery is a pastry lover’s dream. If you can keep yourself from splurging on a oversized cinnamon bun or blueberry scone, you could walk out with one of two pies baked fresh this morning: peach; or fruit of the forest, which boasts blackberries, blueberries raspberries and chunks of pear ($15 each). If you are solo in your search of a Pi Day pie, Mrs. London’s may be the way to go. Their single-serving fruit or lemon tarts offer all the deliciousness of a full-blown pie, but you won’t have to share it with anyone but yourself ($6.50-$7.50 each).